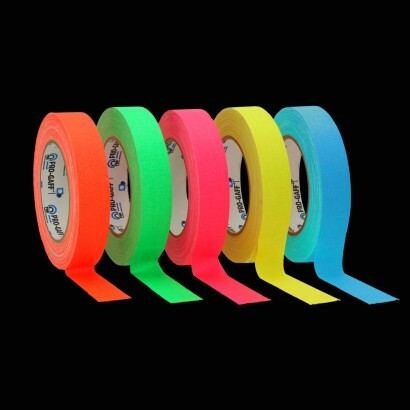 These cloth tapes have around 3 times the tensile strength of standard gaffer or duct tapes whilst still being flexible and tearable by hand. A super strong tape backed with quick grab adhesive making marking out or edging carpets, tiles, furniture...almost any surface extremely easily. Great for UV parties, sensory rooms, blacklight sports such as tenpin bowling, crazy golf, tron style ping pong, nightclubs, Halloween parties etc. Although these tapes are 'climate' resistant, they're not really ideal for outdoors, as the outer is cloth, it would stain easier than say a vinyl finish tape. The dye in these taps reacts greatly to UV lighting, so in daylight you will get the 'Day-glo' effect of high visibility safety jackets, and under UV Blacklight you will get spectacular glowing effects. 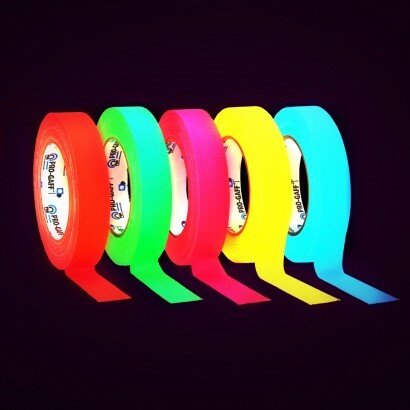 The tapes are available in 24mm wide and 22.8 metres long, or in 50mm x 50m long in fluorescent orange. This stuff tears into strips really easily, sticks like nobody's business and looks great. I love it and I use it for everything.